The Department of Neighborhood and Business Development administers the Lead Hazard Control Program through several special purpose grants from HUD and from the EPA to address lead issues and reduce lead hazards in the City's housing stock. 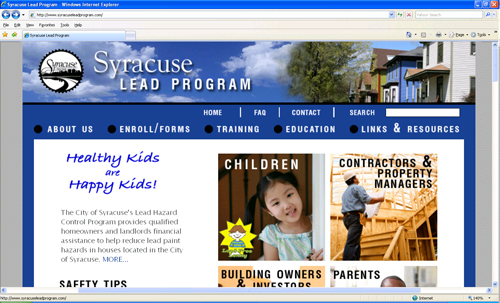 The mission of the Lead Hazard Control Program is to develop additional lead-safe housing in low- to very low-income target areas; to work towards a decrease in the rate of children with elevated blood levels; to improve the environments of families residing in the City; and the continued education of all children and their families on the hazards of lead in the home. For more information about the program, call (315) 448-8710.